DVD Review - "Cloudy with a Chance of Meatballs"
With his hometown of Swallow Falls teetering on the edge of bankruptcy, would-be super inventor Flint Lockwood unleashes his newest creation on the world and watches as it literally takes on a life of his own. After failed inventions like Ratbirds, Monkey Translators, and non-flying Flying Cars, Flint introduces a machine that instantly pops out any food that you might ask it for. In a town that almost exclusively dines upon sardines, this is potentially big business. His invention, however, somehow shoots itself off into space and, like a satellite sending TV signals back down to the population, drops giant quantities of food onto the plates of Swallow Falls. This makes Flint a hero, of course, but the popularity only leads to big problems, mainly due to the fact that the townspeople want more and more, finally taking the machine past the point of safety and smothering the town (and the world) in giant bagels, hamburgers, and the obligatory meatballs. Flint and his gang must stop the machine before the food overtakes the entire world. 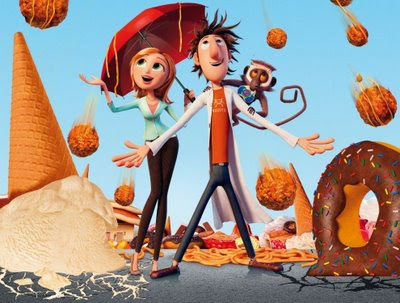 "Cloudy with a Chance of Meatballs" is based on a beloved children's book of the same name. Visually speaking it is unquestionably one of the better non-Pixar animated films I've ever seen. Absolutely stunning visuals. The story is quite original (obviously) and it's very easy to get sucked into to the absurdity of the tale. And the voice talent is as good as you could possibly get for an animated feature. Every voice is a somebody and more importantly, all of the voices work in concert and no one voice dominates the screen. "Cloudy" isn't the funniest cartoon movie I've ever seen but there are enough laughs to go around. What is it that is so funny about a talking animal? Dug the talking dog was perhaps the best character in "Up" last year and in this case Steve the talking monkey brought about more laughs for me than anything else. Somebody needs to study this phenomenon. Anyway, the overall impact of "Cloudy" doesn't quite reach the heights of the Pixar products or Dreamworks' "How to Train Your Dragon" but it is a quality film with a fantastic world in which to operate and a great deal of fun.